A mine, laying on the sea floor, seen through the camera of a ROV. 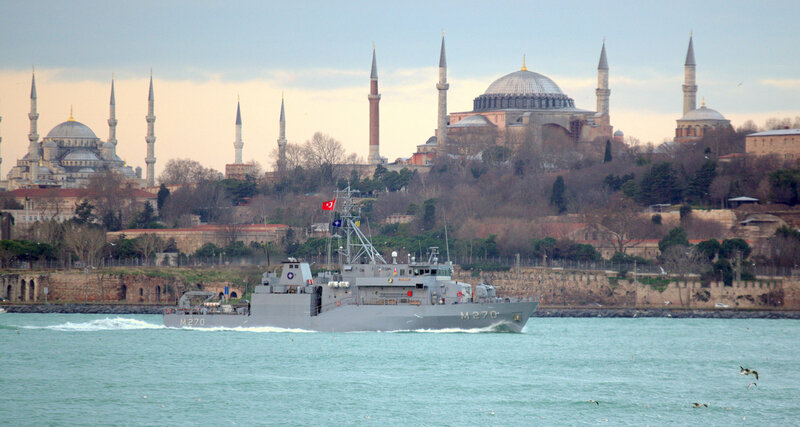 Photo: Official Turkish Navy photo. 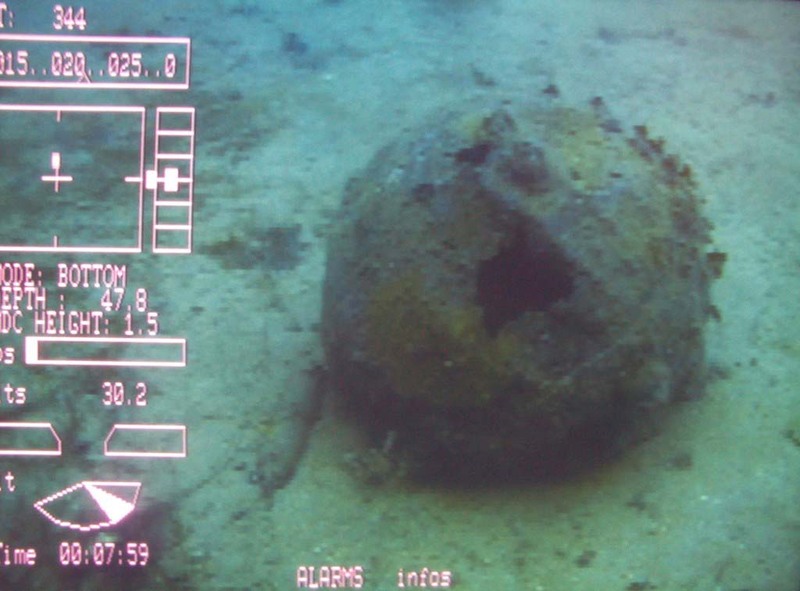 Turkish Navy announced today that 20 mines from World War 1 and World War 2 has been found in Northern and Central Aegean and destroyed by Turkish mine hunters. These mines were destroyed in two separate occasions, on 30 November – 1 December 2013 and on 13 – 15 January 2014. Every year, mines from World War 1 and World War 2, either wash up to shore, get tangled in the nets of the fishermen or found by divers and get destroyed. Mines, whether buried under dirt or lurking in the deeps of the seas are in my humble view are the most loathsome weapons as they can be still deadly after decades. 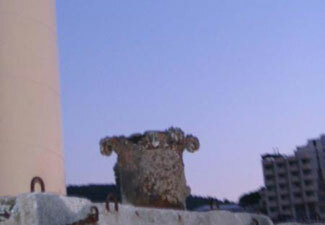 On 31st May 2012, an old and rusty mine was found in a popular beach in Didim, Aydın. A swimmer notified the local police about an odd-shaped rusty metal object laying on the sea floor after she/he injured her/his feed by it. The local police turned to the coast guard for help. Eventually the Navy EOD teams arrived at the beach and after two days work the mine was dragged out of the water to be disposed. 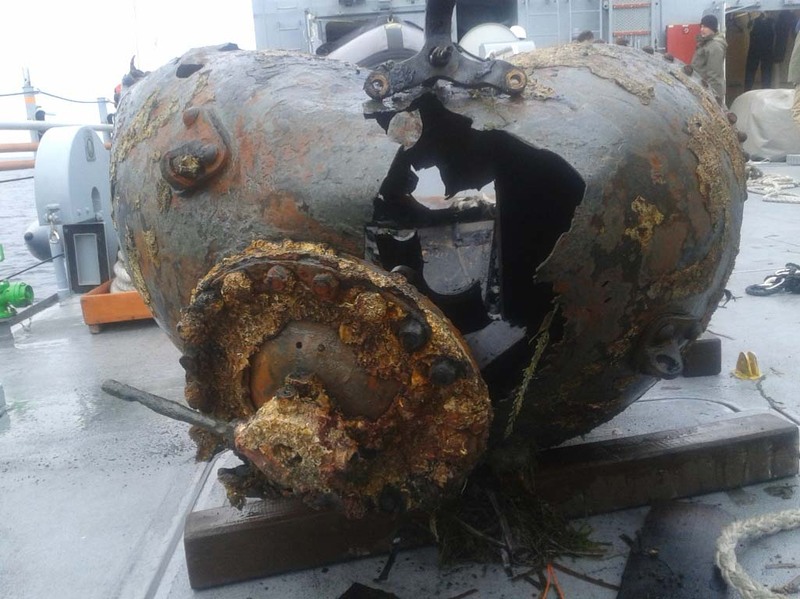 The naval EOD experts stated that the mine was from First World War and was at least one hundred years old and thankfully it was no longer functional. Click here to watch a video of the salvage of the mine. Every year several old mines are found in the waters around Turkey. On 10th March 2012, the fishing boat M/V Yeni Asya returned home with a very unusual catch: a G7A torpedo. 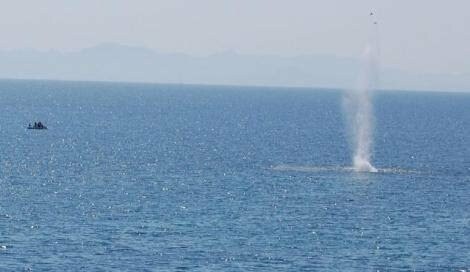 The fishing boat found the torpedo dangled in its nets as they were fishing off the coast of Foça, İzmir. The waters around Foça, located at the entrance of Bay of İzmir is one of the popular exercise areas of Turkish Navy. The fishermen realized that it the torpedo was an inert training torpedo without a warhead as they have encountered similar torpedoes before dully informed the local coast guard station and the harbour master. After the M/V Yeni Asya returned to Foça harbor with the torpedo hanging astern, experts examined the catch. Later it was decided to bring to torpedo to a close by naval base where it will be destroyed. Originally designed for the use of the U-Boots during the 2. World War, the G7A torpedo is used by Kartal class fast attack craft. These vessels build in Germany as a modified Zobel class fast attack craft carry two forward facing 533mm torpedo tubes, one on each side armed with one G7A torpedoes. Click here for a video of the incident. When the crew of the fishing boat Rafet Reis 3 cast their nets off the Kabatepe on Gallipoli Peninsula for a good catch of fish, they found something else: a very old and rusty object. According to the captain of the fishing vessel, they have encountered mines before when hunting in the region. 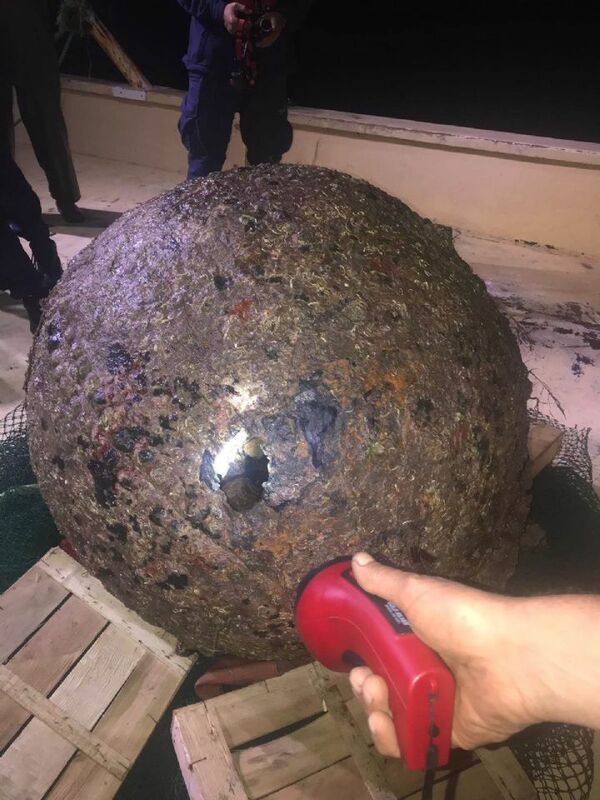 But this time the object did not looked like the other mines they have seen therefore they brought the object to the harbour and notified the Turkish Coast Guard. After the first inspection by the Coast Guard team, the object was identified as a mine and Turkish Naval Forces, EOD teams were notified. It turned out to be a British made mine from the First World War era. 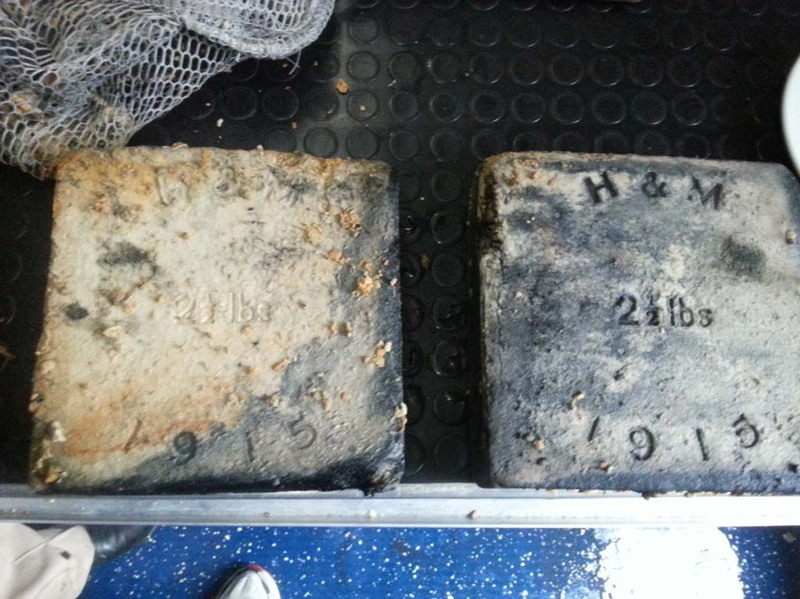 The 97 years old mine was carefully taken of the fishing vessel and loaded on a trailer. The mine was taken to the Suvla beach on the Gallipoli Peninsula where it was destroyed by demolition charges. Click, to watch a, over 5 minutes long vidoe of the transport and destruction of the old British mine. Click for previous similar incidents. The Turkish Navy EOD team inspecting the mine. The close up of the mine. 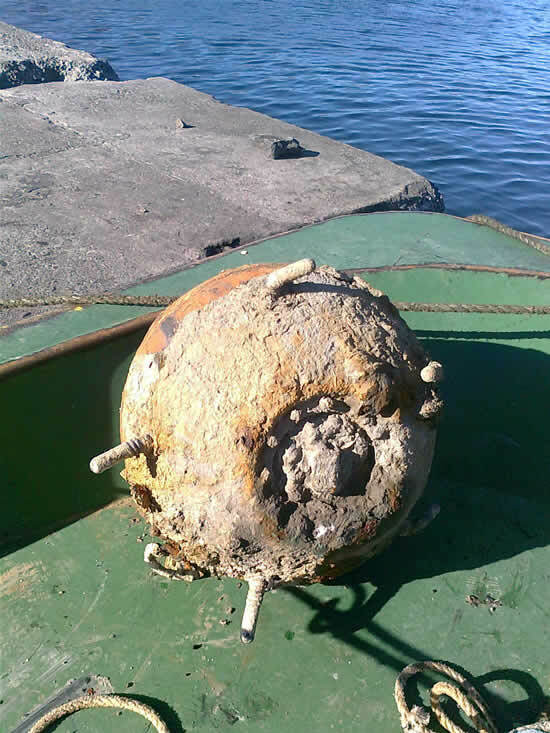 >A fishing boat found a mine in its nets when it was hunting in Güllük Bay, Muğla. The rusted mine was brought to the harbor by the boat and was carefully lifted to the shore. In such cases the local authorities call in the naval special forces EOD teams in order to destroy the mine. In 2010 alone in three different occasions a mine was found in Didim, Karasu and Artvin. The photo is from Posta daily. Mines, whether buried under dirt or lurking in the deeps of the seas are in my humble view are the most loathsome weapons as they can be still deadly after decades. The scenes of old battlefields are ripe with them all over the world. There are an estimated 80,000 unexploded mines remain in the Baltic, mostly laid by Nazi Germany and the Soviet Union during World War II. 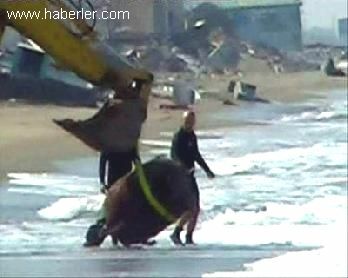 Every year a couple of sea mines are found and destroyed in Turkey. Most of these mines are dating back to the 1st World War. 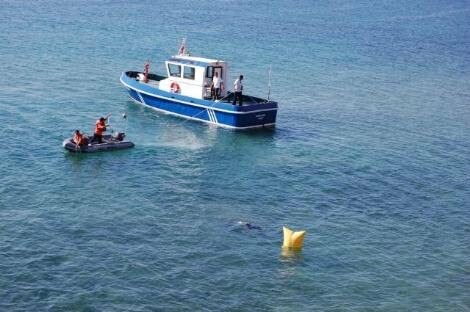 On 8th September a mine was discovered by a swimmer off a popular beach in Didim. An underwater EOD team arrived from Istanbul inspected the mine. It had a diameter of 70 cm and estimated around 200 kg. Later it was taken off the shore, where it was destroyed by demolition charges. A similar mine was found on the Black Sea in April 2010. >Old, Rusty And No More Dangerous. 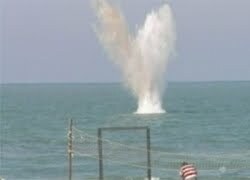 The mine that washed up to the coast of Karasu was destroyed by Naval EOD teams. As reported earlier an old and rusty object was found on the beach by locals. After positively being identified as a mine, the Navy decided to destroy it. The Naval Special Forces EOD teams cleared the sand around the mine and with help of an excavator the mine was lifted to a RHIB. It was taken approximately one and half miles off the shore, where the EOD divers sunk the mine to the sea floor. Later it was by demolition charges. The mine was a German one. The weight of the mine was 1000kg, 300kg of that was the warhead. She is from the wreck of the sunken German submarine U-20 It is difficult to classify it mine form the pictures but it looks like a Type II mine to me. But I am no expert. The fact that it can be still dangerous after all these year is awfull.